A few weeks ago, our family had the opportunity to visit the quaint little Washington coast beach town of Seabrook, WA. Seabrook is a relatively new beach town that was established in 2004. Seabrook is located just south of Pacific Beach on the Washington coast about two hours from our home. An easy drive from Olympia, Vancouver, and the Seattle and Tacoma. This wasn't our first visit as a family, in fact, we enjoyed a stay at Seabrook about four years ago. However, over the years, the town has grown and I was really looking forward to seeing all of the changes. Each of the 200 homes in Seabrook is named. The particular home we stayed in on our visit was named The Bronze Mermaid. The Bronze Mermaid is a 3 bedroom 2 1/2 bath house that comfortably sleeps 8. The cozy front porch is a welcome invitation to grab a good book and a cup of coffee and enjoy nature as you look into the forest. One of the best things about the community of Seabrook is how family and dog-friendly it is. When we came to Seabrook years ago, we were visiting with four other families. All of us had young children at the time, and we were impressed at how stocked each home was with baby toys, baby gates, and plastic baby utensils. They had thought of everything! This time, traveling with our furry family member, we were excited to be able to include her on our trip. We were surprised to find a fully fenced yard for our pup to run and play in, not to mention a few dog toys in the closet! The outdoor shower is such a luxury when coming home from a trip to the beach. Looking off of the front porch this home is perfectly situated to the new indoor pool house (pictured on the bottom left). The home is located on the Elk Creek Beach Promenade, and the front oyster shell path (pictured on the bottom right) leads you through the old growth forest, straight to the beach. Upon check-in, we received this welcome package. It had maps of the town, keys to the pool, shampoo and conditioner samples as well as custom coffee, hot chocolate and snacks and laundry detergent to name a few of the items. I was even impressed that Seabrook included a tide chart in the package. Every little detail was considered. 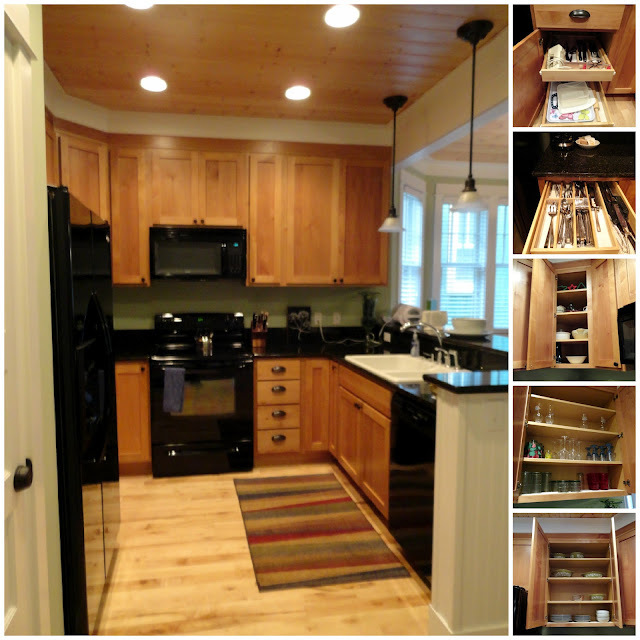 As I mentioned, the homes are fully stocked with everything you could ever think to need! This is true even in the kitchen. All you need to do is add the food. Our menu over the weekend consisted of homemade pizzas, peppercorn steak, and baked potatoes, lasagna, garlic bread and fresh baked cookies for dessert. All of the supplies we needed to make our meals were on hand and readily available in the kitchen, right down to the serving platters! I almost felt like I was in my own kitchen with how well stocked it was! If you ever take your family on a beach vacation, you will quickly realize what a luxury it is to not only have a mudroom but to have a fully equipped mudroom with a half bath and generously sized washer and dryer. It doesn't matter how hard you try, there is always a fine layer of sand on everything. It's nice to be able to wash some of that away before going back to your home. Hooks in the mudroom made it easy to feel like we were right at home. 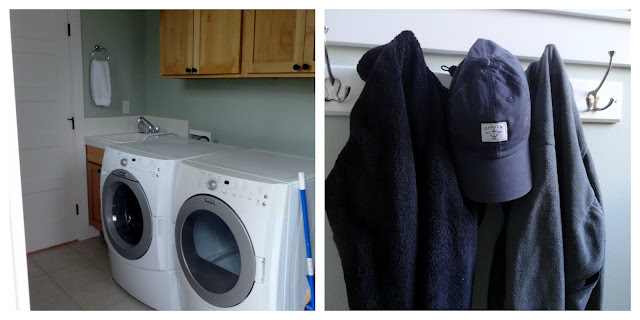 We could easily hang the dog's leash, our hats and fleece jackets on the rack. Traveling with kids is not a vacation it's a trip! 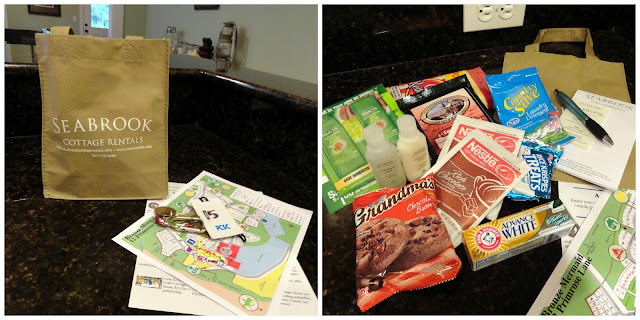 Traveling with kids is not always a vacation. We learned early on that if we went on vacation with our kids we called it a trip. Five people stuffed in a small hotel room with two double beds isn't always conducive to good sleep or high family morale. Again, another reason why we love Seabrook! 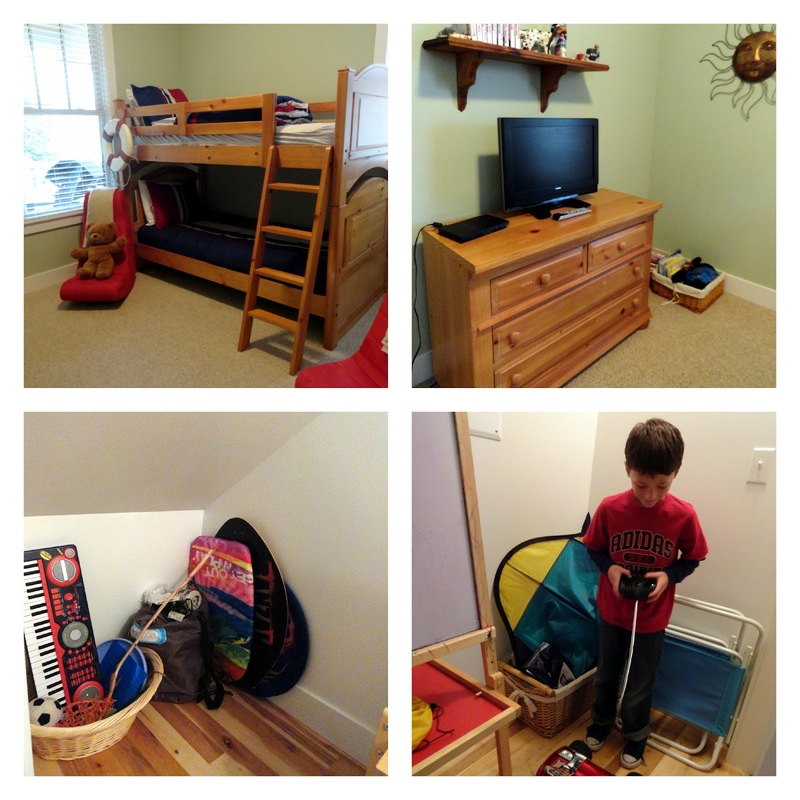 In our home, the younger kids stayed in their fully equipped bunk room. Their room had baskets of toys and books not to mention a fully stocked toy closet across the hall with an easel, kites, and remote control car. Not only does the kids bunk room have a flat screen TV, it also has a playstation 2 with loads of games and DVD's to keep the kids occupied. The guest room has a TV and VCR (providing some nostalgic charm), and several vintage movies to choose from. It was a bit girlie for our teenage son, but he didn't complain (not even about the fuzzy pink robe hanging in the closet) because he had his own space. Which, for a teenager, is a huge bonus! 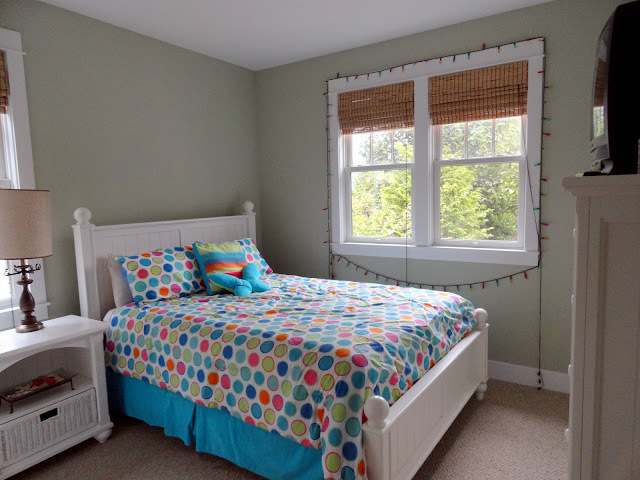 The master suite takes up the whole upstairs and provides lots of privacy and an escape from the little guys downstairs. There is an extra futon in the cozy niche if you need it, but for us, it made for a comfortable place to sit back and read. 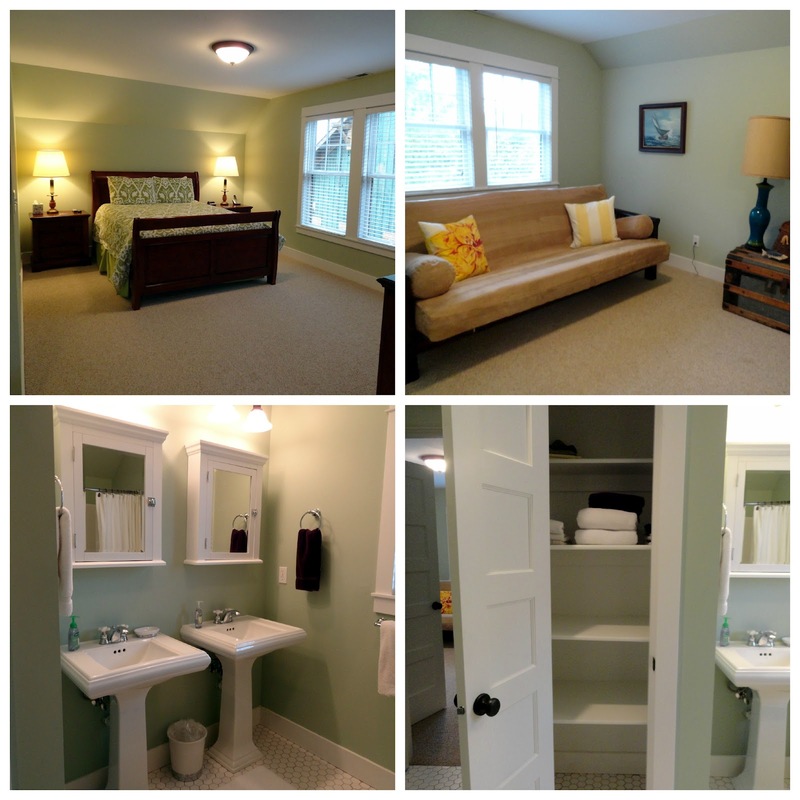 There is a large master closet and a beautiful en suite bathroom to make you feel right at home. It's not hard to find a comfortable place to sit back and relax in this home. The open concept makes having family time very easy. Start a fire in the wood burning fireplace on those chilly evenings, or grab a game or puzzle from the fully stocked buffet cabinet and enjoy some time at the dining room table. We were thankful that these homeowners thought of everything in their rental. Even in the summer, the Washington coast can be chilly, and the owners were kind enough to leave a fully stocked coat closet, just in case you forgot yours. It certainly wasn't hard to get comfortable and feel at home in The Bronze Mermaid. 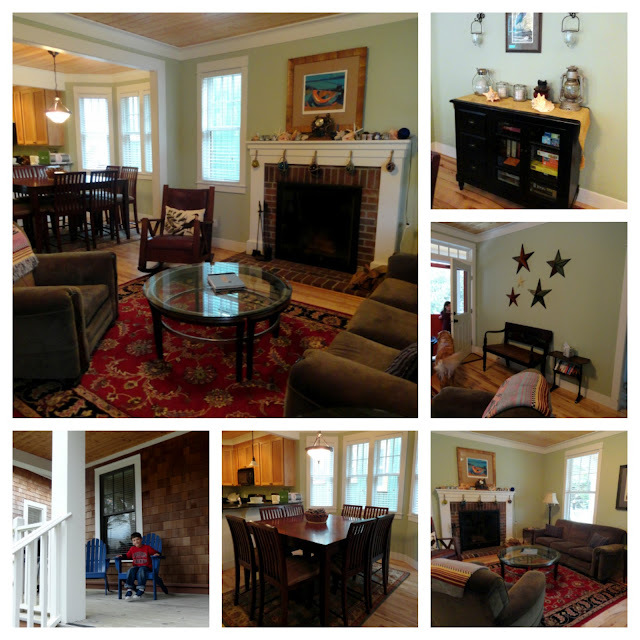 Thank you for sharing your rental home with us at Seabrook. 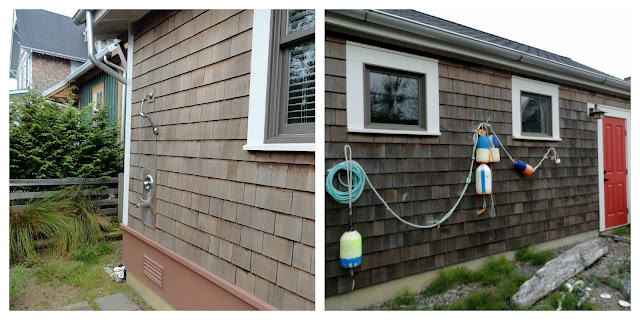 If you think this rental house is adorable, stay tuned for more posts featuring other cottages in the town of Seabrook. 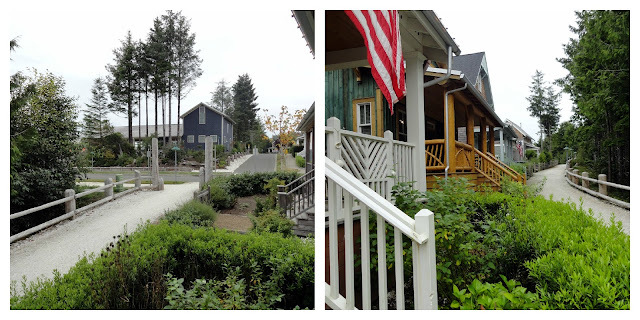 I can't wait to tell you more about this adorable little town! If you are interested in renting The Bronze Mermaid, you can find more information about renting this home here. Don't you want to go?! disclaimer: I was given a two night stay in exchange for a blog post. My opinions however, are 100% mine. Oh Rachel, that looks like my dream house! What a fun trip! Sounds like a wonderful house but what about the town? What things did you do? I was looking for blogs about Seabrook to share on our site and I came across your post...If you're open to it, shoot me an email at jane(at)dwellable(dot)com. Fall decor cheaply done, but not looking cheap! Sweaty bands knock off Olympics style!